This month we feature Eva Milka as part of our Women Migrants in Business Series. Eva comes from Poland and relocated to Ireland in 2005. In 2013, she set up her company Gaelic Escargot. Gaelic Escargot is in its seventh year. The farm specialises in the Helix Aspersa Müller variety at its base in Garryhill, County Carlow. 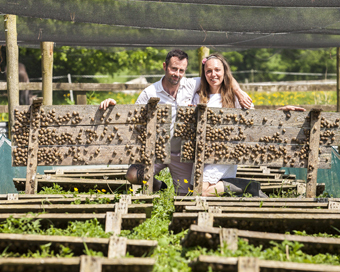 The company run by Eva and her partner, part-time baker Eoin Jenkinson, also provides training for aspiring snail farmers and breeding stock. She tried snails for the first time during a visit to France in 2011. The trip was a birthday gift for her friend Anna – who is now her “snail godmother – when we go away; she feeds the snails”. But when she got home, having failed to find snail producers locally, she began to rear snails in plastic containers in her one-bedroom apartment in Kilkenny. Her hobby led to a plan to set up a snail farm. “People laughed at us.” However, when she approached her Local Enterprise Office in Carlow with the idea, they encouraged her to pursue it. Language skills was a barrier at the beginning of her entrepreneurial journey. While Eva had studied English for eight years, she struggled with conversational skills. However, she gradually became braver, and her English improved. She received funding and advice on regulations from LEO. Eva is grateful for their “amazing” support without which she says Gaelic Escargot wouldn’t be here. Having taken part in the New Frontiers programme, Gaelic Escargot was previously a finalist in the Best Young Entrepreneur competition. Eva is currently participating in the State-run Food Works programme. She believes Ireland is a land of opportunity. “The potential is just massive especially in the food sector because we are a farming country and we have an amazing reputation for food.” A member of Euro-Toques Ireland, a community of chefs and cooks committed to supporting artisan food producers, Eva is also involved with Carlow Tourism and the Restaurant Association of Ireland. Gaelic Escargot is export-focused, and primary targets are the French, Italian and Spanish markets. While Irish people are becoming more aware of the health benefits of escargot – the meat is high in protein and low in fat – she believes it will take “a year, five years or 10 to break the psychological barrier to eating snails, but that it will eventually be commonplace to see escargot on restaurant menus and in supermarkets here. Ireland has ideal conditions for breeding snails: land, clean water, good soil, a country with a tradition for agriculture and an excellent reputation for food. But she says they initially based their methods on existing breeding techniques. Their first three breeding attempts failed. They had to develop a new breeding method to suit Ireland’s “microclimates”. The farm essentially became a research and development centre. Drawing comparisons between other European countries like France and Italy which have 40 years of experience in snail farming, compared to Ireland’s six and a half, she says Gaelic Escargot would welcome State research and development support to set up a pilot farm. Cultural differences haven’t been an issue as Eva says Irish people are like Polish people but more open. Eva feels at home in Ireland and is blessed to live in county Carlow waking up every morning to the “magical” view of Mount Leinster. Two-thirds of Irish farms are not financially viable, according to Teagasc. Eva believes snail farming is a viable solution for farmers who want to diversify to remain sustainable. Snails don’t require much space; one acre can sustain one cow or produce 10 tonnes of snails, she says. Snail farming has gradually taken off with 41 farms registering in Ireland since 2015. Eva views her contribution to the movement as a “small part of something big”.